At the beginning of 2015, Robin Billingham was the guy. The goaltender helped the Concordia Stingers win the first game of the Ontario University Athletics playoffs against the McGill Redmen on Feb. 11, saving 40 out of 44 shots. The second game two days later became a different story. After McGill scored five unanswered goals, Billingham was pulled. Concordia’s then head coach, Kevin Figsby still had confidence that his starting goaltender could win the series in the final game. It didn’t happen. Billingham was pulled again after three goals, and the Redmen eventually won 6-3, ending the Stingers’ postseason hopes. In the world of goaltending, the line between being a hero and a zero is a thin one. In university hockey, if a goalie has one bad game, they could be sitting on the bench for the foreseeable future. The 2014-15 season was Billingham’s first year with Concordia, but he already had two years of university hockey experience before coming to Montreal. 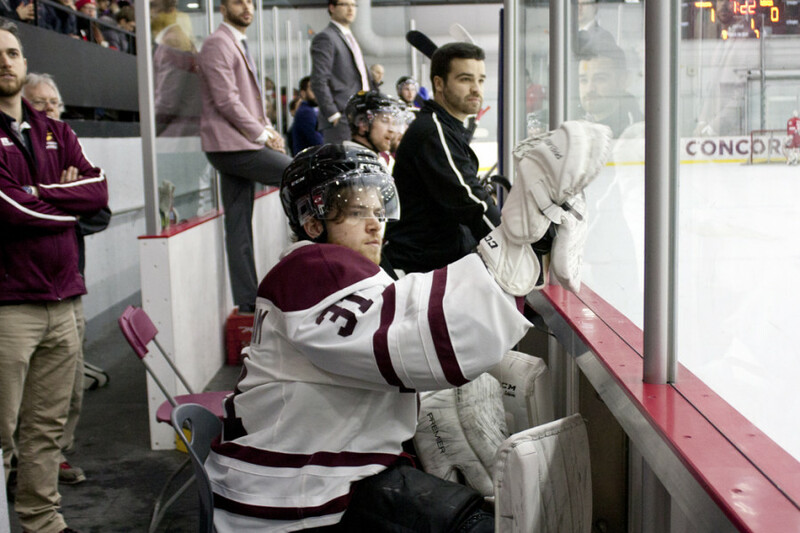 With the University of Ottawa Gee-Gees, Billingham served mainly as the back-up goalie. After the team was shut down due to sexual assault allegations against a few players in 2014, he was invited to try out with the Stingers. He ended up making the team and the starting job at Concordia. “It was challenging because I had to make a transition, a decision on whether or not to kind of stay in Ottawa or to make a move and come to a different city,” Billingham remembered. Fast-forward to this year’s playoffs in February, and the Stingers were in the same position against the Redmen, but this time Billingham had to watch from the bench. Despite coming in as relief to starter Miguel Sullivan in the first game, he did not see ice again for the rest of the series. Concordia again lost to McGill. Stingers head coach, Marc-Andre Element, never saw Billingham or Sullivan as a starter or backup. Sullivan started 14 games, while Billingham started 13 in the 2015-16 season—he won two games. Element liked having them both, as they pushed each other to improve and that’s why they split most of the starts in the regular season. Throughout his career on the Stingers, Billingham has had some issues with consistency. In some games he would almost singlehandedly help the team win, but other times, he let in savable goals that cost the team. Getting over bad goals is one of the biggest challenges goalies face, according to Petizian. But in university hockey, the games are so few and far between that it can be harder to forget about a poorly played game. This is an issue that Billingham faces. To battle the issue of not seeing game time for a while, the coaches like to make the goalies work hard in practice. The team regularly has game scenarios during practices, so that goalies can be ready if they have to play during any given game. Billingham says Petizian has taught him skills to improve both his mental and technical game. Going into the offseason, Billingham will see a sports psychologist, which isn’t uncommon, even for professional athletes. Current Pittsburgh Penguins goalie, Marc-Andre Fleury, went to see a psychologist after his less-than-stellar playoff performances, which cost the team in the NHL playoffs in previous years. for keep his save percentage high. Element believes that winning is a team effort. He’ll never blame goalies for a goal because hockey is a team game. But for next year, Element has confidence in the soon to be third year goaltender. Element plans on having a private conversation with Billingham to really identify the issues he should work on for the next season. With a long summer ahead, Billingham is currently working on his marketing business, Billingham Marketing Solutions, but when the season starts, it’s back to being the best goalie he can be. “Every single night I come in, I want to win,” he said.